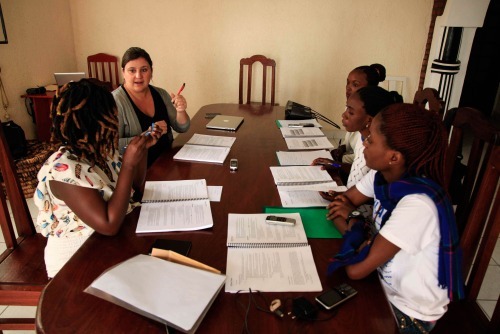 Categorized as: Africa, Girls & women, Grantee, Job Creation, Our Partners, Poverty Alleviation, Stories, Storytelling & Tagged as: Cristi Hegranes, Democratic Republic of Congo, Global Press Institute, Journalism on November 15, 2014. What started as a journalism job for Cristi Hengranes in Nepal turned into a mission to educate, employ, and empower women journalists in developing media markets all over the world. This post originally appeared on Global Press Institute‘s blog. GOMA, DEMOCRATIC REPUBLIC OF CONGO: In the first hours of the morning, the sky over Lac Kivu transforms from black into a grapefruit pink hue just as the sky did over Lago Aitilan. Less than 30 days ago, my jet lag woke me up to witness the pinking skies of rural Guatemala. Today, the same confused internal clock (and a cluster of noisy birds) woke me in time to see the sunrise over Lac Kivu in Goma, Democratic Republic of Congo. It dawned on me again this morning that the pieces of our world are more alike than different. A month ago, I was a passenger in a little grey car that sped up the winding and well-paved road between Guatemala City and the Solola Department, where Global Press Institute opened a new, independent news desk on October 20. As we drove, I remembered the first time I traveled to a far away place all alone. 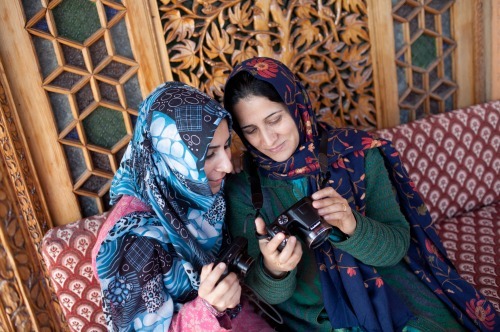 Reporters at a photography training in India-administered Kashmir. It was to Nepal. I was 22. I remember being dazzled by the perfume of Kathmandu—wood smoke and diesel—that filled my nose as I exited the airplane onto the runway. I still love that smell—the very same one I was treated to when I stepped off the plane and onto the tarmac in Kigali, Rwanda on Sunday night. Now, at 34 years old, that smell reminds me that I am still filled with the same wonder that first pushed me into Nepal a dozen years ago. Yesterday, on a different winding and well-paved road, the one between Kigali and Goma, the sameness of our world washed over me again. New crops, the color of neon green finger paint, push through red earth. Rain falls in angry bursts but quickly forgets its temper. Children play with not-quite-full soccer balls. Gaggles of men discuss the disappointment of their politics at tiny roadside bars with amusing names like Eden Pub and Nowhere Tavern. People till the earth covered in the dewy shine of their hard work. Women carry impossible loads on their heads. Schoolgirls in knee socks emerge noisily from schools. Morning skies are pink. White geckos come out at night. That same sameness, I realized, is what makes GPI work in Nepal and Nigeria, and in Cameroon just as it will in Congo. The universal power of story and the desire for truth live everywhere. Nearly nine years ago, I decided to stop being a reporter in order to put the craft of journalism to a better, higher use. It was my dream as a 25-year-old to train local women in developing countries to become world-class journalists. Trained, employed, and empowered by the profession I loved so dearly, I was sure that women everywhere could bolster their own lives, communities, and countries with the power of journalism. 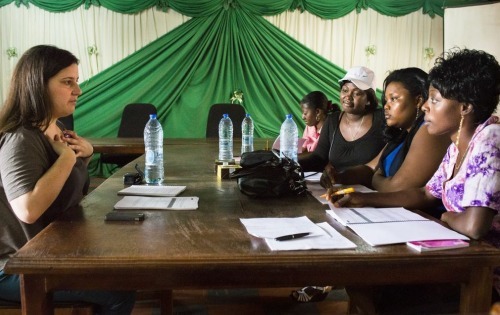 Reporters undergoing rigorous training for the new GPI Democratic Republic of the Congo News Desk. Proof of concept took time. For years we were lumped in with the citizen journalism crew and the blogging crowd. For even more years we were limited by meager funding sources. But slowly, our powerful, professional journalism began to punctuate change. As we expanded across the world, women in Mexico, Nepal, and Kenya heard our call to become journalists and they showed up in droves. The lure was the opportunity to cultivate their curiosities in hopes of disseminating access to valuable information. This opportunity would not only change their professions, but would also allow their communities to be freer, fuller, more informed, more powerful. Sri Lanka. Zimbabwe. Indian-administered Kashmir. The list began to grow. Cristi Hegranes training reporters from the GPI Cameroon news desk. The quality of the journalism soared. Stories no other outlets were covering. Context and source access foreign correspondents could only dream of. Readership began to grow, too. The world was listening. Awards began rolling in. Proof of concept began to cement. Slowly but surely the world has come to know what I believed all the time—when local women are empowered in positions of literate leadership in the dignified profession of journalism (yes, there is dignity the way were do it at GPI), a world of possibilities comes into view. A world where news is different than punditry. Where balance is not an ironic tag line. Where the pursuit of story and the pursuit of justice are one in the same, every time. Where readers are informed instead of scolded. Where opportunities to discover newer, fuller truths about complex issues emerge with every story. 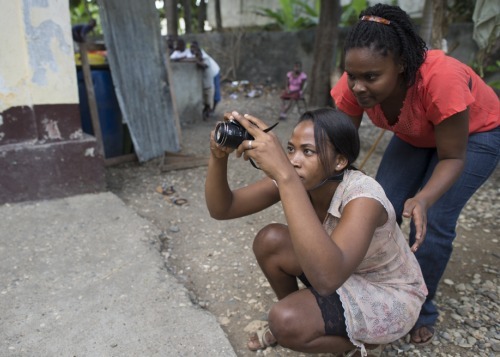 GPI Haiti reporters spruce up on photography skills. And that is the best sameness of our world – the fact that GPI journalism works everywhere. That’s how I found myself standing on the border of the Democratic Republic of Congo yesterday. At the border, I stood in a tiny police station that was filled with too many people and an odd number of broken chairs. We were detained for nearly two hours, but we had expected that. As we waited for arbitrary decisions to be made, power to be flexed, bribes to be requested, I was filled with the same butterflies in my stomach that visited me on the first day of school. Eager anticipation, nervousness, and wonder. For the 27th time my little idea to train and employ local women to be ethical, investigative journalists was pushing over a new border and into a new place. Congo is a place so distorted by its own corruption and so stereotypically covered by mainstream media—war, poverty, disaster, disease, repeat—our work is deeply needed here. We have the power to diversify the singular narrative that has long plagued this place. We have the power to increase access to information, to elevate awareness, to provoke change. 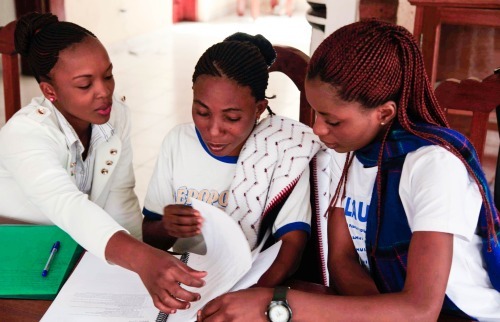 GPI Democratic Republic of the Congo news desk reporters learn elements of investigative journalism. So this morning, as the grapefruit sky gives way to the full light of day I am again preparing for a first day of school. In only hours I will meet Mariam, Esther, and Marveille—three women whom I have never met in person but who passed the rigor of GPI recruitment. Three brave souls who heard the call to change the news in their community and came running. Today, they will join an incredible group of women who are united by a deep desire to tell stories that transcend borders and barriers. In the coming weeks and months they will become compassionate interviewers, tenacious researchers, bold reporters. They will join a family, my family, of journalists who are bound by a common passion for storytelling and a shared desire to use information to change our world. Good morning, Goma. I’m pleased to meet you. 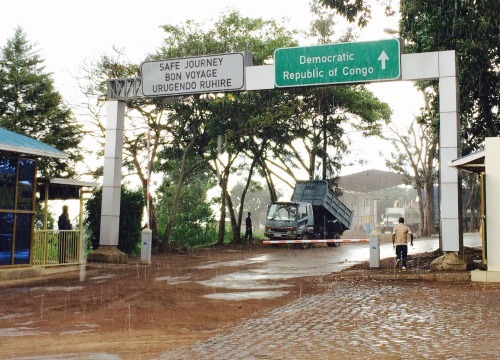 A rainy welcome on the DRC border. All photography provided by Global Press Institute. Copyright Global Press Institute/Paige Stoyer. LEARN more about Global Press Institute here. To read stories written by GPI reporters, head over to the Global Press Journal. 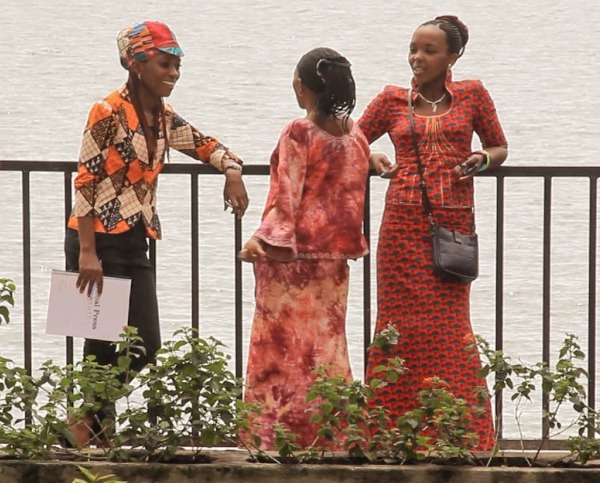 DONATE to Global Press Institute’s mission of educating, employing and empowering women journalists in developing media markets by clicking here.